I was on the fence whether or not to post this. First, the picture isn't the best quality, and second, I made this literally 4 months ago (around the same time that I disappeared from the blogging world whooooops.....). I figured I would post this anyways because one..I LOVE IT and two...these posts seem to be very popular. It's really such a great DIY gift. I made something similar for my brother's 21st birthday three years ago and it remains one of my most popular blog posts yet. You can see that here. I had so much fun making this birthday gift. 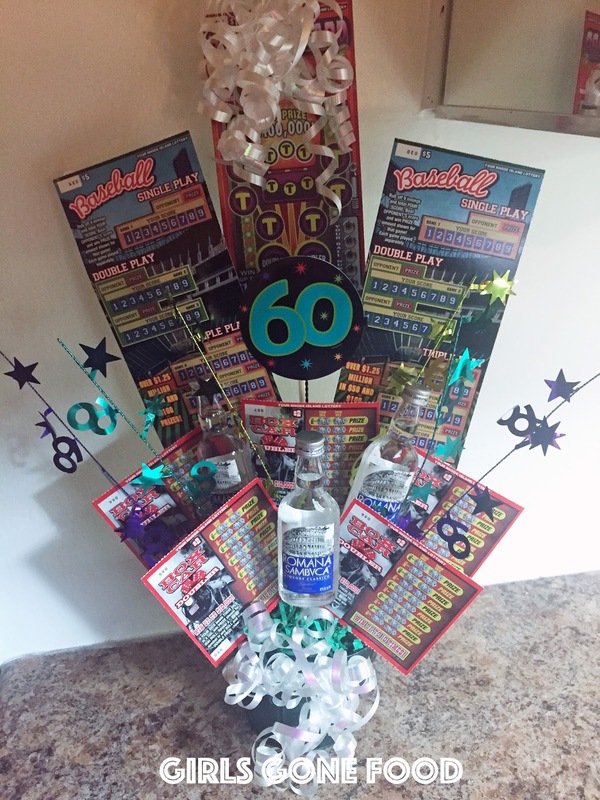 I love making bouquets/baskets (or whatever you call it) for birthdays or other special events because you can personalize it and decorate it based on the their favorite things. It also looks so darn good. It is really quite easy to assemble! Place the styrofoam ball or block into the can. You can cut around the edges to ensure that it fits. Tape the lottery tickets and liquor bottles to the skewers. Stick the skewers into the styrofoam, arranging it so that small items are in the front and large items are in the back. Decorate around the bouquet with ribbons and other decorations. Like your birthday present idea very much. Once I had presented my friend with the online lottery tickets, see TheLotter review. Still this looks much better. Carry on! Thumb up! thelotter review you mention is also not bad but as you say it is different. One day they will put you on a list of look at here famous people born on your birthday. For the time being, be happy being on my list of favorite people. Happy Birthday. Great idea. I was thinking about some hand-made present for my girlfriend's birthday. She is not indifferent for French Lotto results. So it will do (but for the liquor which I'll substitute by some sweets)! This is a fantastic website and I can not recommend you guys enough. Charity runs succeed in a number of unique ways to raise cash.Check A very awesome blog post. Yes, flowers can work ponders when you need to break the ice. Truth be told, we can place it thusly - flowers liquefy the ice that existed amongst you and your neighbors. Flowers, with their captivating magnificence and awesome aroma spread warmth and decent sentiments that can truly soften hearts and that as well, in only a couple of moments. The distinctive palette of hues that develops in fall is perfect for a floral course of action blessing. What's more, there is no compelling reason to constrain yourself to a centerpiece. Flowers for Thanksgiving Day plans outside and in the normal ranges of your home include an inviting touch that your visitors will unquestionably acknowledge on any day of the year. Roses can likewise be orchestrated relying upon your slant. A bundle of Red Roses with a couple of fillers is staggering sight. Likewise, send bouquets of grouped sweet Roses too to your loved ones. On the off chance that you've appended a little love note to it which says, "I Love You", at that point there isn't much else hypnotizing than that. On the off chance that Heart-formed Balloons, Soft teddy bears, and chocolates are likewise on your Valentine Gifts from valentine flower delivery service list this season, at that point Combos can be masterminded too alongside flowers. Now, lotto is still with people, inspite of how the estimated 99 togel lotus4d percent of players really are winners and also the others of 1 % are mere intermittent winners.